now reading: Can China Realize Africa’s Dream of an East-West Transport Link? Portions of the proposed East-West link already exist, in the form of the Trans-Africa Highway 5. The most credible proposal for a full continental connection builds on these, and plans to link them. 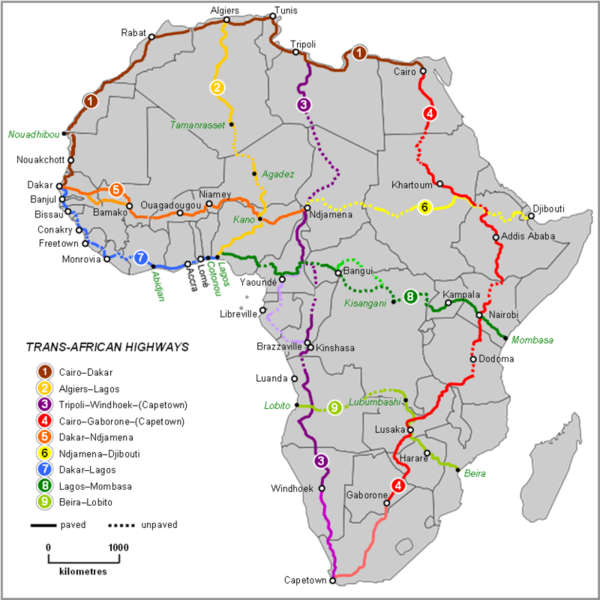 TAH5 is the most significant precursor to a full transcontinental African transport corridor. It is part of a proposed nine-highway network originally put forth by the United Nations Economic Commission for Africa (UNECA) in 1971 (We Build Value, November 8, 2017,) and currently undertaken by the agency in conjunction with the African Union, and the African Development Bank, and external stakeholders. The highway connects Dakar, in Senegal, to the Chadian capital of N’djamena, about 4,500 kilometers, or a little further than the distance from New York to San Francisco. It runs through seven countries, Senegal, Mali, Burkina Faso, Niger, Nigeria, Cameroon, and Chad. The TAH5 is the only one of all the Trans-African highways to be fully completed and it represents a major development victory for that reason. However, sections of the road are dilapidated, and upkeep across national borders remains a challenge. The proposed East-West link, supported by the African Union, but still in the process of finding financing, would connect Senegal on the Atlantic to Djibouti by on the Red Sea by building new roads and upgrading degraded sections to extend the existing TAH5, with matching rail links. The finished project would add Sudan, Ethiopia, and Djibouti to the countries already connected by TAH5, and would span 8,715 kilometers, or a little less than the distance between New York City and Midway Atoll. The rail component is even more challenging than the road component, since most of the preexisting rail connections would have to be upgraded from narrow to standard gauge, and massive gaps—in some cases as large as 4,000 kilometers—in the proposed route would need to be bridged. The current estimated delivery date for the Dakar-Bamako section of the project is 2022 (PIDA. November 24, 2017.) If completed, the project will improve goods transport speeds fourfold, and provide a vital new link to the sea for Mali, improving the prospects of its gold mining sector. However, the difficulties facing even this relatively short stretch underscore how challenging the full Dakar-Djibouti multimodal transport corridor will be. Full completion will be hampered by security concerns in Chad and Sudan, and rocky terrain in Ethiopia. Another issue is the pressure cash-strapped individual governments face to focus their limited resources on projects that would secure them immediate direct connections to ports; this could make it difficult to convince them to work together on trans-frontier developments whose benefits for intra-continental trade lie in the relatively distant future. Transfrontier infrastructure, such as the Standard Gauge Railway, has the potential to mitigate some of these pressures, especially in tandem with Belt and Road-related developments like new ports. However, concerns are being raised about how sustainable the resultant debt would be for some of these lowest income countries. That being said, UNECA’s proposal for a Trans-African Highway Network, which sounded like science fiction when it was first announced in 1971, has now begun to move towards reality. The completion of TAH5 and a growing network of railway lines in East Africa have made African mega-projects feel more feasible now than in the past. This is partially thanks to the impact of Chinese infrastructure investment in general, and the Belt and Road Initiative specifically. The Belt and Road Initiative is a sprawling transnational infrastructure expansion project that has rapidly become the centerpiece of Chinese outward investment. It essentially uses infrastructure provision to connect China to Europe via two routes: the Silk Road Economic Belt runs overland from China to Germany via interlinked rail connections through Central Asia, and Central Europe. More pertinent to Africa, the 21st Century Maritime Silk Road is a sea route from China to Greece. It travels via the India Ocean to Mombasa, Kenya, and then through the Suez Canal to the Mediterranean. On paper, BRI only grazes Sub-Sahara Africa before moving north to Egypt. However, Mombasa also becomes the node where the Belt and Road Initiative meets East Africa’s Standard Gauge Railway. This connection enables a host of development opportunities that in turn could help to fund some of these trans-continental rail networks. The clearest case in point is Ethiopia. The railway line between Addis Ababa and Djibouti was funded by Chinese lenders and constructed by Chinese contractors. But China’s involvement didn’t end here. Ethiopia has eagerly embraced a Chinese model of centralized economic planning focused on manufacturing and assembly in special economic zones. Several such zones were funded by China, and initially populated by Chinese apparel and shoe manufacturers (Brookings, January 30, 2018.) These have since been joined by European counterparts like H&M, setting Ethiopia up as a low-cost assembly hub exporting to Europe (H&M Group, May 26, 2016.) While Ethiopia isn’t formally on the Belt and Road route, cross-frontier rail infrastructure still enabled it to become an exporter along BRI arteries. In addition, BRI-related projects in East Africa have also proven that it is possible to build this kind of infrastructure, and in the process has arguably improved investor confidence. For example, Tanzania recently put out tenders for its own section of the standard gauge railway, and struck a deal with a Turkish contractor at a significant saving per meter of track compared to Kenya’s Chinese-built section (Daily Standard, November 8, 2017.) While one can fault the Kenyan deal, I would argue that the success of these early developments broke down entrenched biases against funding African infrastructure among a wider range of funders. This could potentially also speed up the completion of a connection between East and West Africa. The dream of a connection between East and West Africa, and a resultant increase in Africa-fueled trade and development has long haunted the continent. The evolution of unified development goals such as the African Union’s Agenda 2063, shared regional and continental institutions enabling measures such as the recently decided continental free trade agreement, and the presence of new sources of development funding make this dream seem more possible. However, Africa will have to ask hard questions about debt, sovereignty, and foreign power influence. The recent case of Sri Lanka losing control of a Chinese-financed port is already raising worried discussion in Africa (Daily Standard, February 26, 2017).Achieving the dream of unifying the continent is going to demand complex choices. Any East-West connection across the width of Africa would function as a de facto extension of the Belt and Road Initiative to the Atlantic Ocean. Such a connection would significantly increase Chinese presence on the continent, especially if Djibouti is its eastern anchor, because also houses China’s first overseas military base. While this might worry Western powers, Africa would arguably see it as a small price for a long-cherished dream.